The recent volcanic eruptions in Hawaii and Guatemala are potent reminders that our planet is capable of unleashing its pent up fury at virtually any given time. Predicting eruptions isn’t easy, but some volcanoes are more worrisome than others. Before we list our planet’s most “overdue” volcanoes, it’s important to establish some perspective. Like earthquakes, volcanic eruptions are almost impossible to predict. Scientists aren’t at the stage yet where they can reliably tell when an eruption is imminent, but they’re steadily getting there. What’s more, the suggestion that some volcanoes are more “overdue” than others is a notion that resides in the eye of the beholder. 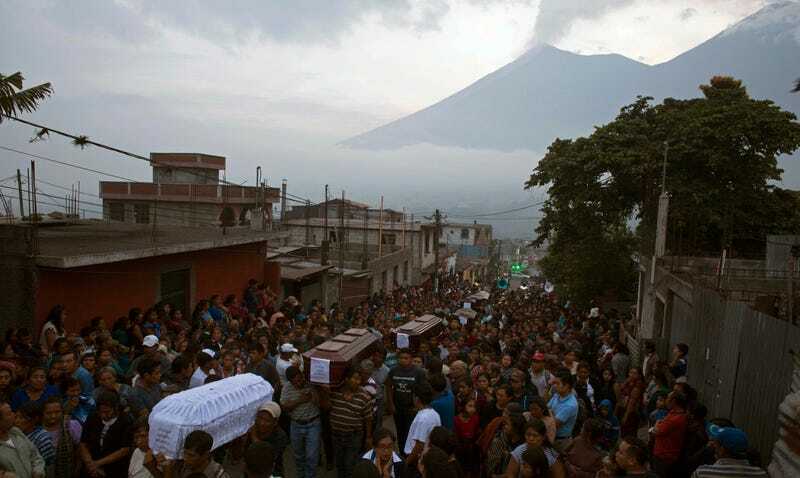 The coffins of several people who were killed during the eruption of Mount Fuego this past Sunday in Guatemala. An eruption at the Yellowstone Caldera would be particularly bad, with experts predicting a resulting lava flow extending outward for 30 to 40 miles. An eruption of the Yellowstone super-volcano may not happen for thousands of years, but research shows we’d only have about a year’s warning to prepare such a cataclysmic event. Eruptions on Mt. Etna as seen from the International Space Station in 2002. Tracy K.P. Gregg, a geologist at the University at Buffalo, said it’s almost impossible to know which volcanoes are more likely to explode than others, but we’re not completely helpless in this regard. That said, we know precious little about most of the world’s active volcanoes. There are about 550 active volcanoes on land, which doesn’t include the many volcanoes on the ocean floor. Gregg said only those volcanoes located near populated areas of first-world countries, such as the United States, Japan, and Italy, are monitored on a regular basis. Eruption of Mt. 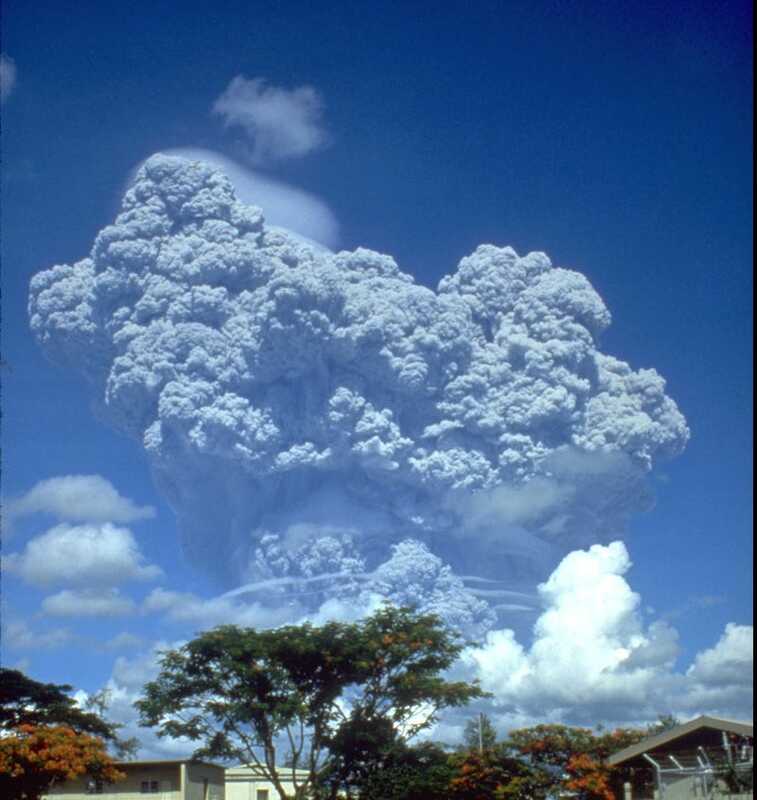 Pinatubo, June 12, 1991. 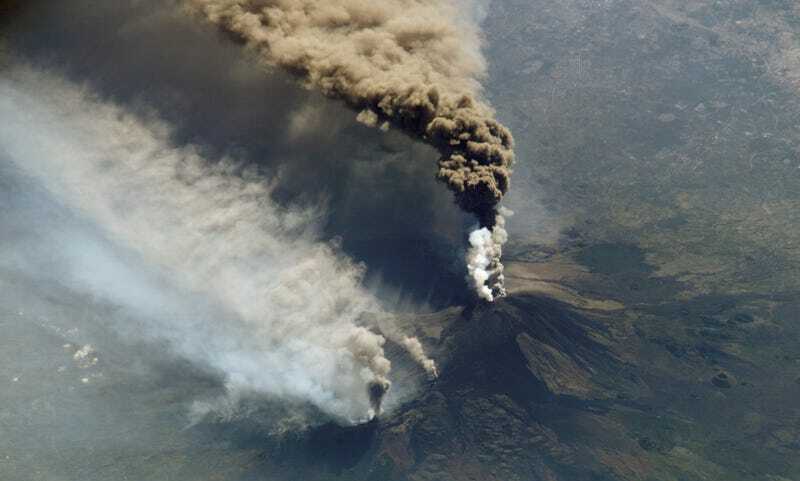 Frighteningly, Gregg said it’s entirely possible, even likely, that the volcanoes we should be watching out for are the ones we know little about, such as Mount Tambora in Indonesia and Iwo Jima off the southern coast of Japan. In terms of knowing which volcanoes are currently more apt to explode than others, Edwards said we should be watching all volcanoes that have experienced eruptions within the past 10,000 years. Ideally, he said, we should gradually remove people from these known hazard zones and increase the monitoring of those volcanoes. Needless to say, de-populating potentially dangerous areas is easier said than done. Conspicuous by its absence is Mount Fuego, which erupted in Guatemala on July 3, killing over 110 people and with scores still missing. The IAVCEI list is a best guess, and the sad reality is that scientists don’t know which volcanoes are more prone to explode than others. Mount St. Helens, for example, is not on this list despite its huge, deadly eruption in 1980. Scientists say St. Helens is currently in “recharging” mode, and that it’s in no danger of exploding anytime soon, but as Fuego demonstrated, we can’t be completely sure. As for Mount Kilauea in Hawaii, it’s not on the IAVCEI list because it’s not considered a major threat to human life; Kilauea’s oozing lava and toxic gases are certainly inconvenient, but it’s not terribly dangerous compared to volcanoes that can expel huge volumes of ash and generate dangerous pyroclastic flows. 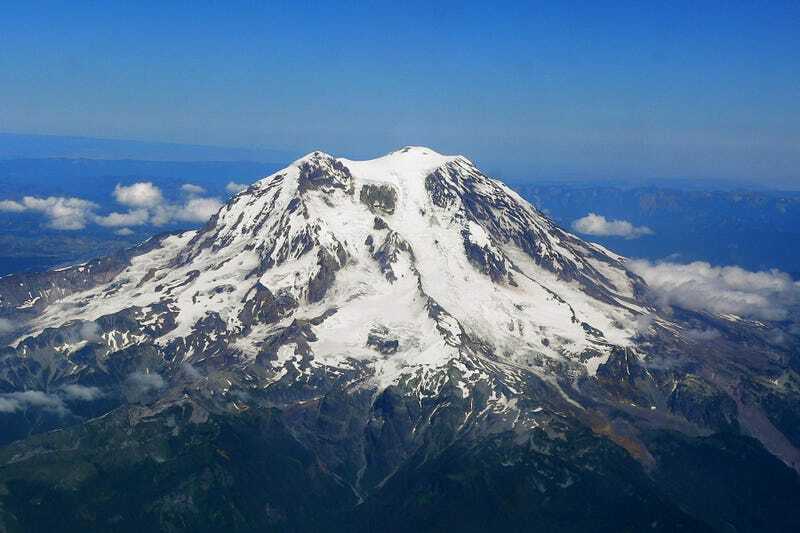 No doubt, Mount Rainier is considered one of the most dangerous volcanoes in the world, and with its copious amounts of glacial ice, is considered a significant threat to the entire Puyallup River valley and the 3.7 million residents of the Seattle area. The volcanoes at the top of Edwards’ personal watch list include Katla and Hekla in Iceland, Villarrica and Llaima in Chile, Klyuchevskoy in Russia, Veniaminof in Alaska, and Etna in Sicily. “These are all snow/ice-covered volcanoes that have a reasonable probability of erupting in the next 10 to 50 years,” said Edwards. “You can bet that if any do erupt, I will do my best to head their way to study volcano-ice interactions!” Eruptions on mountains with snow and ice are particularly scary because the resulting meltwater can produce far-reaching lahars — roiling slurries of debris reminiscent of wet concrete. But as Gregg explained earlier, some of the most troublesome volcanoes may be the ones we know the least about, or the ones we least suspect. Here’s hoping that science will eventually show us a way toward more reliable prediction of volcanic eruptions.